- Equipped with a new Pull-Ring technology keeping them from opening and closing at the wrong time facilitating control while using them making them easy to use and allowing storage with other Kitchen utensils. 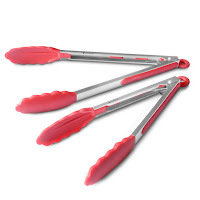 - Heat Resistant and Non-Removable Silicone Tips - Superior Quality Silicone Tongs are completely heat resistant to 480ºF, giving you peace of mind that the silicone will not melt and contaminate the food. - 403 Stainless Steel Handles - Ergonomic Handles with soft pads allow safe handling of food without the risk of them bending, breaking or rusting. Dishwasher safe facilitating your day-to-day to give you easy cleaning. - 100% Guarantee - If you have any problems FOR THE LIFETIME OF THE PRODUCT, we will refund your order in full PLUS supply a new item. Add to cart now because you literally risk nothing. I love using nonstick pans for cooking but often have problems with finding quality utensils to use that won't scratch the surface off or melt when I'm cooking. 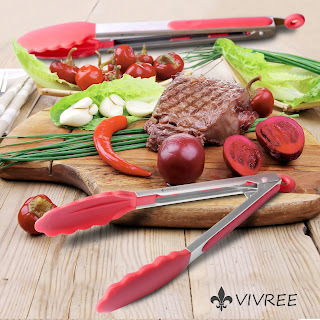 Trying out these Vivree Kitchen Tongs set for this review was a wonderful experience. Strong, quality tongs that don't scratch my pans or easily burn/melt when used. I love the durable silicone grips that make it so easy to pick up or turn food without slipping out. The handle are so much softer and more comfortable than other tongs I've tried that I have not used my cheap tongs at all since these arrived in my home. The pull-ring open and close feature is wonderful and so easy to use. Makes them easy to store as well as easy to open an use. I highly recommend these Vivree Tongs for everyday cooking, you don't have to be a master chef to enjoy using these wonderful kitchen utensils! Disclosure: I received a discounted price for the item(s) mentioned in this post through Tomoson in exchange for my honest review. Regardless ~ All my reviews are my honest and personal opinion. I am disclosing this in accordance with the Federal Trade Commission’s 16 CFR, Part 255: “Guides Concerning the Use of Endorsements and Testimonials in Advertising.”.